Lab updates section 2.3 of their Terms of Service – will it calm doubts? Update, July 20th: My personal opinion on this update. Update: For a legal view on this update, you might want to chack Vaki’s (also known as Agenda Faromet) blog post on these changes. On Wednesday July 16th, Linden Lab updated section 2.3 of their Terms of Service and issued a blog post on the matter, indicating the update is an attempt to clarify the Lab’s intent with regards to user content in Second Life. The changes to Section 2.3 come in the 5th paragraph, commencing “Except as otherwise described”. For ease of reference, I’ve reproduced the paragraph as it read in August 2013 and how it now reads in July 2014, with the updated text highlighted. While this may be an attempt to clarify the meaning and intent of the ToS, I cannot help but question it’s overall effectiveness – although I do so with the clear statement that I am not a lawyer, so this is simply unqualified opinion. Yes, the revised wording does apparently set out limitations, but the context in which this is achieved seems to be confusing. Agenda Faromet explained during the Legal Panel discussion on the matter in October 2013 as to why terms such as “sell / resell” aren’t perhaps the issue in a legal context (see her comments here), but the lack of limitations on any assigned right are. Yet, within the revised ToS, the way in which the limitations are presented parenthetically might be taken to mean they only apply to the matter of “sell, resell or sublicense (through multiple levels)”. Moreover, the limits as stated, would appear to stand in contradiction with a further clause in the ToS which was introduced with the August 2013 changes, and remain unaltered with this update. To wit: that LL can “otherwise exploit in any manner whatsoever, all or any portion of your User Content (and derivative works thereof), for any purpose whatsoever”. Hence, to the untutored eye, it is actually hard to discern what the Lab is in fact saying with this update, or what they are actually addressing. Whether this apparent contradiction, if it is a contradiction, affects how the update might be legally interpreted, I leave for minds wiser and better qualified than mine. But given the wording “for any purpose whatsoever” with regards to how SL content might be used did give rise to considerable angst when it first appeared in the August 2013 ToS, I do wonder if its continued presence will remain a cause for concern among content creators. 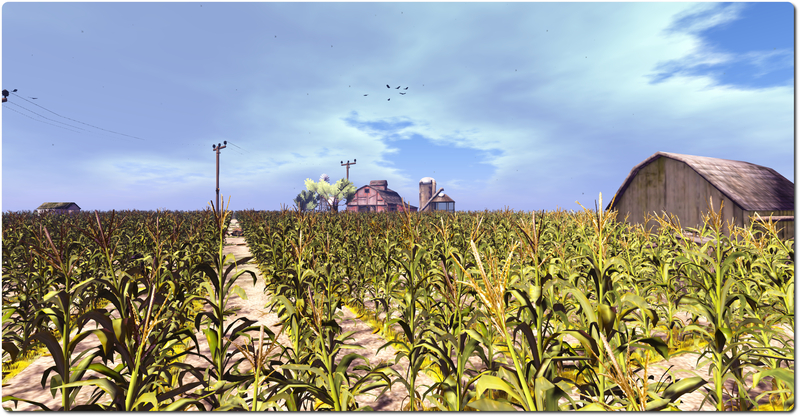 On Monday July 14th, Linden Lab issued the Experience Keys project viewer alongside the launch of their Experience Keys demonstration game, The Cornfield, which I’ve reviewed separately. 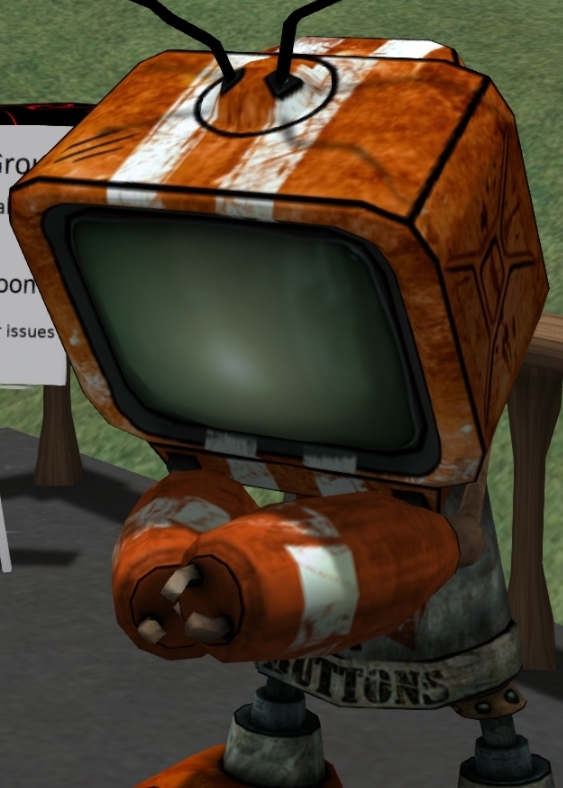 As a quick overview for those not in the know, an Experience in Second Life can be almost any immersive / interactive environment within SL where the user needs to provide permissions for objects, etc., to interact with their avatar. Experience Keys mean that anyone wishing to participate in any activities suited to the use of Experience Keys need only give their assent once, thereafter, actions within the Experience which affect their avatar happen automatically – teleports, attaching a HUD or item of equipment, etc. – without any need for user approval (although notification of so actions may still be displayed in the viewer window). The Experience Keys project viewer – version 3.7.12.291846 at the time of writing – is available from the Alternate Viewers wiki page, includes a number of key UI updates which are used alongside experiences in Second Life, and which apply to those creating experiences, those using experiences, and those who allow experiences to run on their land. 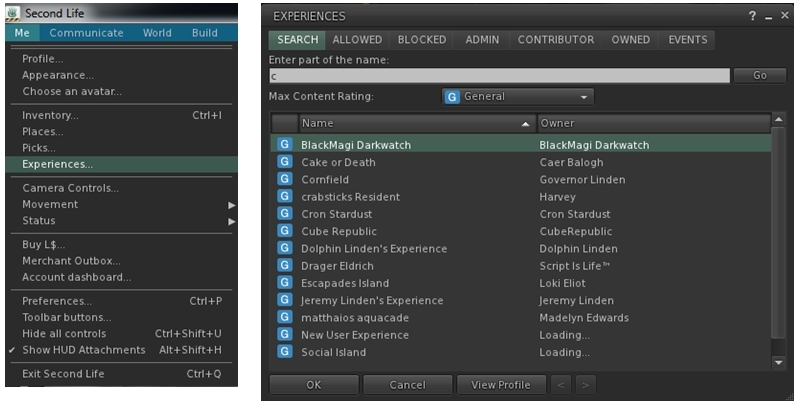 Please note that until server-side support for Experience Keys is fully deployed across the main grid (Scheduled to complete on Thursday July 17th, some elements of the viewer will not function on BlueSteel or LeTigre RC regions – for example, searching for experiences will not return any result if you are on a region running on either of these two RCs). Within the Experience Keys project viewer, this is accessed via Me > Experiences (no toolbar button or keyboard shortcut with the project viewer), and provides the means for users to locate experiences in Second Life, manage the experiences they have encountered during their travels through Second Life or which they have created or contributed to, and also check any actions any given Experience has performed on their avatar. It comprises five individual tabs. Allows you to locate experiences in SL by all or part of their name and filtered by maturity rating. The tab also includes an option to view the profile for an Experience (see below). These two tabs allow you see those experiences you have either allowed – that is, you’ve granted permission to – and those you’ve blocked. 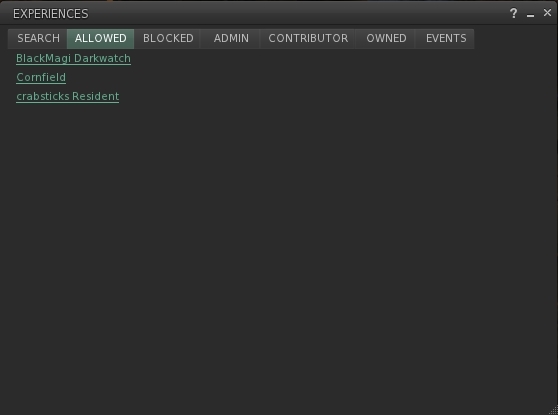 A blocked experience is one in which you have refused to participate and have blocked it so that you will no longer be prompted to join it whenever you visit a region / parcel where it is active (until such time as you choose to revoke the block). Each tab displays a list of experiences by name. Clicking on a name will display the relevant Experience Profile (see below). Those experiences you have created and own. While an experience can be a collaborative piece – hence the Admin and contributor roles – one avatar must be the designated owner of an experience and hold overall responsibility for it. < and >: page through the list. Forget: If you have previously added an Experience to either your Allowed or Blocked list, this button will remove it from whichever list it appears on. This means that for a previously allowed Experience, you will have to once again agree to participate in it when you next visit, and for a previously Blocked Experience, you will receive invitational dialogues on visiting it once more, allowing you to participate in it, if you’ve changed your mind. Report: opens the Abuse Report floater, which has been pre-populated with the relevant information, allowing you to instantly file an Abuse Report against an event / object which is causing grief / harassment. As always, please refer to the server deployment thread for the latest status / updates / issues. On Tuesday July 15th, the Main channel was updated with the Experience Keys project, which had previously been running on Magnum. This roll-out coincides with the release of the Experience Keys project viewer (see below) and the release of the Lab’s first Experience Keys demonstrator game, The Cornfield. Please refer to the release notes for further information. On Wednesday July 16th, the Magnum RC should be updated a new infrastructure project that adds support for the upcoming changes to the Skill Gaming policy. This would appear to be the changes required to support the new Skill Gaming region type. Release notes. On Thursday July 17th, BlueSteel and LeTigre will both be updated with the Experience Keys project, but will otherwise remain on the same server maintenance project as week 28, which addresses a JSON-related bug, an interest list related race condition, and to improve L$ transaction logging for payments made by scripted objects. See the release notes (BlueSteel) for details, and part 2 of my projects update for week 28. As noted above, the Experience Keys project viewer, version 3.7.12.291846, was released on Monday July 14th. This provides viewer-side support for accessing and managing SL experiences using the new Experience Keys permissions capabilities. 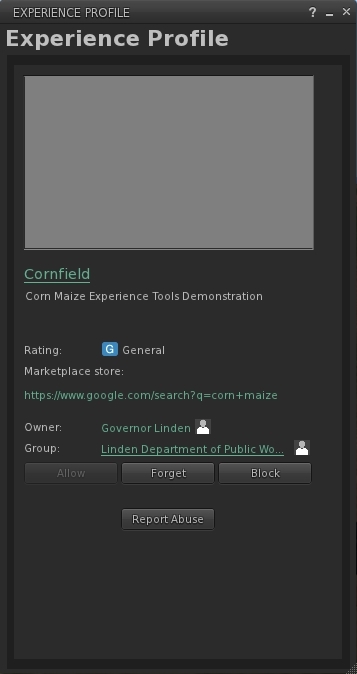 This viewer can be used in conjunction with the Lab’s Experience Keys demonstrator game, The Cornfield, and with other experiences as they are opened to public use. Please keep in mind that the viewer may not behave correctly until after the server-side deployment of Experience Keys support has completed on Thursday July 17th. There are also some further notes from Dolphin Linden on the subject, below. Dolphin Linden again attended the Simulator User Group meeting on Tuesday July 15th, where he answered more question on the Experience Keys project. An estate / parcel setting to block all grid-wide experiences from running on an estate / parcel. Currently, any grid-wide experiences which come on-line have to be explicitly blocked by name, which means if an estate / parcel owner didn’t want any grid-wide experiences running on their land, they’d have to keep adding them to their block list as and when they become aware of them. A single check-box option would eliminate this. Feature requests are to be filed on both of these points, which the Lab have agreed to look into. There have been renewed reports of region crossing issues which seem to be occurring regularly, but only between certain regions when tested. The issues mainly appear to affect vehicles and take the form of the avatar taking an exceptionally long period of time to cross between regions – with the vehicle the avatar is say upon taking up to 30 seconds longer. When this happens, the avatar appears to be visually unlinked from the vehicle, but the vehicle itself fails to get auto-returned, as the simulators appear to consider the avatar and vehicle as still being linked. Motor Loon provided some specific details on the issue, and has indicated he will raise a bug report using the information he has, as the Lab are unaware of any specific problems which may cause this. However, while it has yet to be confirmed, it was also reported at the meeting at a similar issue on a region crossing between two regions was resolved by restarting them in a specific sequence.